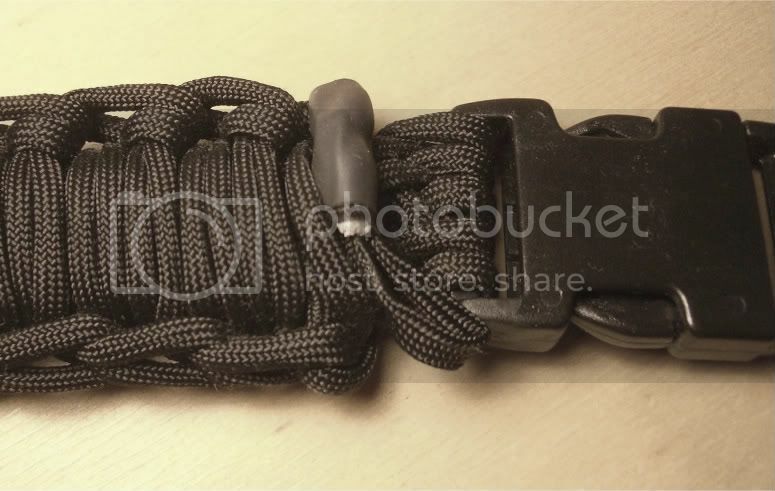 I've been working on this idea which is an expansion of the paracord survival bracelet. The idea is for an accessory that one can wear which can quickly unravel to provide the useful cordage in cases of emergency. The average bracelet is made using approximately 15 to 20 feet of parachute cord. The perferred stuff is the Type III or 550 cord. This versatile cord has a breaking strength of 550 lbs. I thought...wait...in an emergancy, you might not have time to sit around and unravel a bracelet. Also, 20 feet or cord is nice, but seems like if you were in a survival situation, you would want much more cord. I read one hiking page that recommended you carry 50 ft of 550 cord in your backpack. I came up with the idea in my mind to make an easily unwoven belt. That lead me to do some research. I came across Stromdrane's Blog which is a great source of inspiration. He lead me to the Slatt's Rescue Knot. Stromdrane did point out that the knot was very fustrating I and agree completely. Using this basic knot, I've created two different types of belts in two different sizes for a total of three different types of belts. Confused? Take a look below. The top two rows are Slatt style belts in 1.5" and 1.25". The third row is a hybrid creation which I will discuss below. The Slatt style belts are implementations of the Slatt's Rescue Belt, but with some differences. I've added a steel buckle, a quick release system which I installed on all the belts, and a paracord belt keeper which falls off cleanly as the belt is disassembled. I currently have access to three different finished on the buckle. From left to right it's antique brass, pewter, and then chrome. Now let's talk about the hybrid belt. I call it a hybrid belt because the core fo this belt is a Slatts Rescue knot. I found that when using 1 inch plastic hardware, the Slatts type of belt only allowed me to weave less than 40 ft before I reached the length I needed. To solve this problem I worked out an overpleat wrap that allowed me to use all 100 ft to make a usable belt. 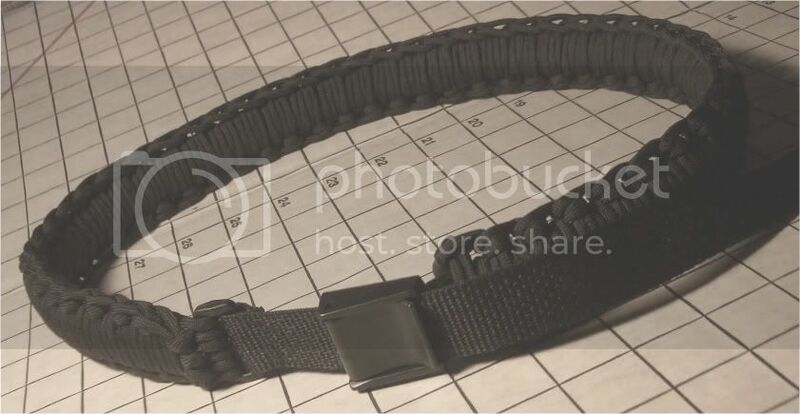 Also, this belt uses plastic hardware and nylon webbing which allows to belt to be adjustable. The buckles that I chose on this belt are cambuckles. They can be made with side release buckles also. Now the quick release mechanism I was talking about. The belt is ended with a small loop of gutted paracord. The whole thing is secured with heat shrink tubing. The connection is designed that only a very strong can free the paracord. One strong pull of the loop, the entire belt will become 100ft of 550 paracord. If you are interested in buying a belt, they are $50 + shipping. All belts are handmade by me and custom orders are encouraged (makes sure the belt is correct length). If you want a custom color, I need at least two orders in the color before I can justify the cost of buying the paracord. Email me at card1shark@gmail.com and we'll get that process rolling. Having seen these in person, they are indeed awesome and have a really nice look. ...or if you are Diffy, what will hold up all the crazy stuff you have attached to your belt? 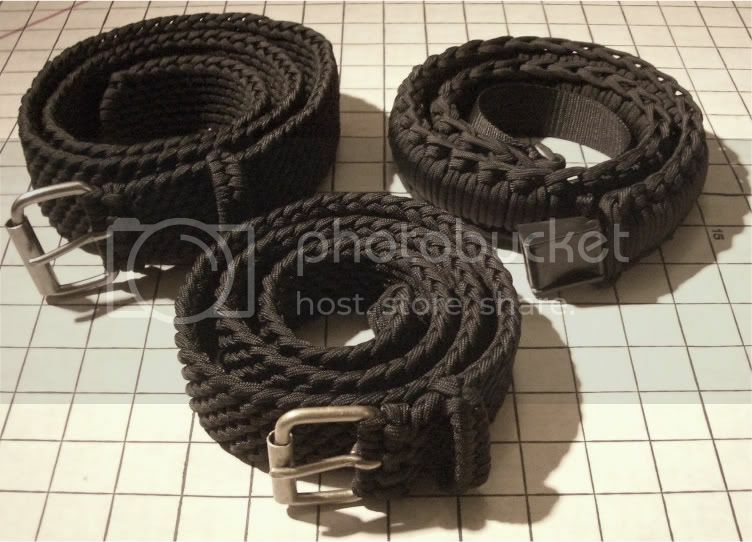 The paracord belts look great! 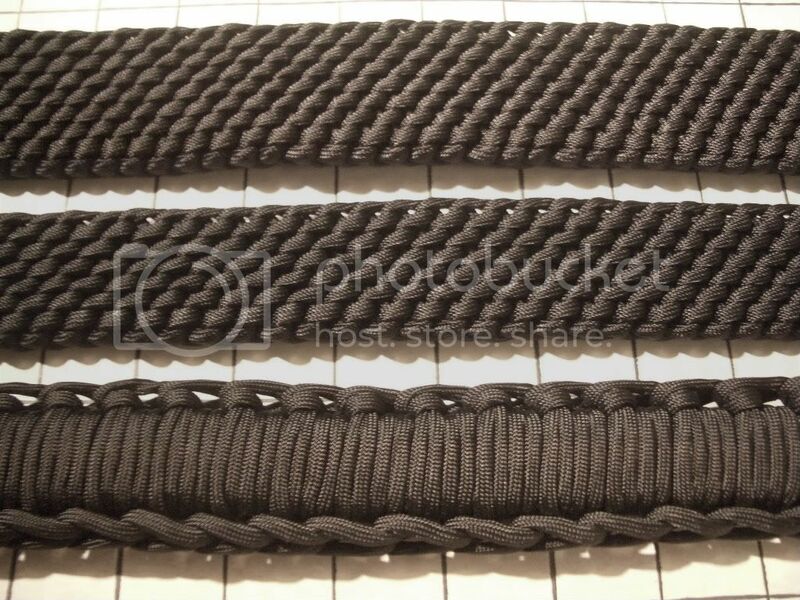 Are the two belts you refer to as "Slatt style" made using the Slatt's Rescue Knot, or is it a modification on that knot? The belts look great. I'd be interested in trying to make one. Could you make a tutorial? There is no modification to the knot. They all use the knot exactly as described by Slattery. do you sell these? i would love to buy one. Do you have the tie pattern for the overlay? how do you tie off the ends?? ...and some more versions too!